Caves are home to over 100 different kinds of animals. We can recognize some of these animals (like crickets and millipedes ). But there is something different about them. The crickets and the millipedes are white! Why would these animals appear so different just because they live in caves? 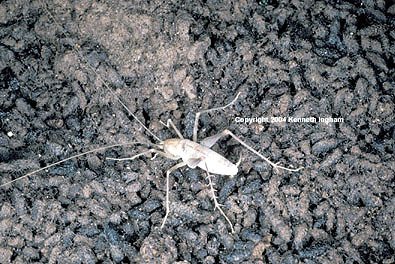 This cave cricket is a great example of a cave critter, just look at how white he is! The simple answer is adaptation. Just think…what would it be like to live your life in constant darkness completely separated from the outside world? You would have to adapt too. Well, cave animals have adapted. This adaptation is what makes them different. In this section you will learn about all of these inhabitants of caves and their special characteristics.